San Bernardino Attackers Were Radicalized Before Meeting, FBI Director Says : The Two-Way During congressional testimony, James Comey said Syed Rizwan Farook and Tashfeen Malik were talking about martyrdom as early as the end of 2013. A photo provided by the FBI shows Tashfeen Malik (left) and a photo provided by California Department of Motor Vehicles shows Syed Farook, who attacked a holiday gathering of county workers in San Bernardino, Calif., last week. The husband-and-wife team who killed 14 people during a shooting rampage in San Bernardino, Calif., had been radicalized before they "started courting or dating each other online," FBI Director James Comey said on Wednesday. Details about Syed Rizwan Farook's and Tashfeen Malik's lives have been sparse, but during congressional testimony, Comey outlined some hints of what may have led the couple to open fire on a holiday party at the Inland Regional Center where Farook worked. Comey said the couple had talked about jihad and martyrdom as early as the end of 2013. NPR's Dina Temple-Raston, citing an official familiar with the case, reports that a friend of Farook has told the FBI that he and Farook had planned and abandoned a possible terrorist attack in 2012. The FBI is investigating, Dina says. 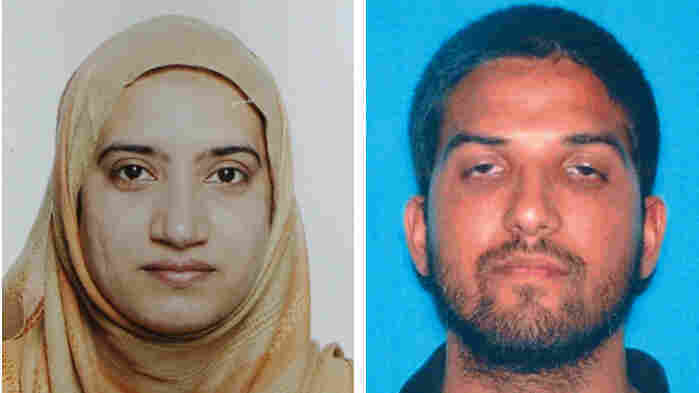 The Los Angeles Times reported that Farook and Malik first married in Mecca, Saudi Arabia, in 2014, and then, after Malik was given a conditional green card and entered the U.S. in July of 2014, the couple held a second ceremony in California. Earlier this summer, the couple had a baby girl. As we've reported, neither of them had a criminal record. Farook has been described as "quiet" and Malik has been described as "a modern girl." Comey said investigators are still trying to figure out why the couple ultimately targeted the holiday party and whether they had plans for more attacks. Malik, NPR's Carrie Johnson reports, made a post to Facebook pledging allegiance to the Islamic State just before the attack. But Comey said authorities are still assessing the nature of the inspiration they took from foreign organizations. Comey said that Malik's radicalization predated her fiancee visa and the rise of the Islamic State. -- Authorities are questioning Enrique Marquez, a longtime friend who owned the assault-style rifles used in the rampage. -- Authorities are investigating whether Marquez bought the guns for Farook back in 2011 and 2012 or if he bought them for himself and then subsequently gave them to Farook. -- The guns were modified. California requires assault-style weapons to have a tool to detach a clip from the weapon to reload and bans magazines with more than 10 rounds. The assault-style weapons in the attack had been modified so the tool wasn't needed, and they had 30-round magazines. -- Marquez could be charged because private transfers of guns are supposed to go through licensed dealers in California. -- Officials believe the couple financed the attack themselves, maxing out their credit cards and getting a loan from an online bank.